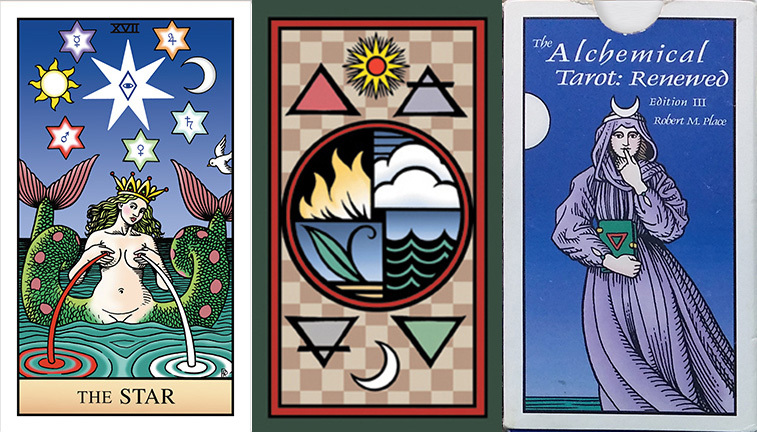 This page is designed to help people who are collecting the Alchemical Tarot to identify the different editions. There are four editions identified below by the box cover, and the front and back of the Star card. I picked this card because it was the first one I designed for the deck and it was first published in a article in Gnosis Magazine before the deck came out. The first edition of The Alchemical Tarot, called simply The Alchemical Tarot, was published in 1995 by Thorsons, the UK branch of HarperCollins. The original Lovers card I designed for the deck was considered too sexually explicit. So I redesigned it with the Lovers only kissing. Also I designed the cards to be the same proportions as the Waite Smith cards but the publisher wanted them wider. So I devised the border design with the columns to take up the extra width. It came in a boxed set with a book that I co-authored with Rosemary Ellen Guiley. That is why both our names were on the box, and the box is actually larger in relation to the cards than is pictured. The second edition of The Alchemical Tarot was published under my publishing label, Hermes Publications, in 2007. This was called The Alchemical Tarot: Renewed. For this edition, I reproportioned the cards so that I did not need the border design. This allowed the imaged to take up a larger space on the card without making the card larger. I scanned all of the drawings into the computer, made improvements, and recolored them. I also included both versions of the Lovers card, the censored one and the one that was originally published, making it a 79 card deck. The third edition was published by Hermes Publications in 2011. It was called The Alchemical Tarot; Renewed Third Edition. It again had 79 cards. I made improvements in the coloring and drawing and added some additional alchemical symbols. One of the biggest changes was the addition of wings on the beast depicted on the Eight of Swords, making it a combination of the four beasts of the Evangelists, depicted in the corners on the World card. The design for the back depicts the four elements and the two principles on a checked background. In 2011, Hermes Publications also published an updated and greatly expanded companion book, Alchemy and the Tarot: An Examination of the Historic Connection with a guide to the Alchemical Tarot. This book is now out of print. It was meant to be a guide to all versions of the Alchemical Tarot and even to the Tarot of the Sevenfold Mystery, which is closely linked to the Alchemical Tarot. The fourth edition was published by Hermes Publications in 2015, and it is called The Alchemical Tarot: Renewed Fourth Edition. For this 79 card edition I totally redesigned the coloring by placing the drawings on a tan antique paper and coloring them with layers of transparent color, like an antique alchemical manuscript. I again made improvements in the drawings and added many more alchemical symbols, particularly on the trumps, where I added a symbol for the alchemical operation that each card represents. These are all operations that are part of the Great Work of alchemy, the work that leads to the formation of the Philosopher;s Stone. I again redesigned the card back, which depicts the Lady Alchemia, the mother of the elements, the the material of the Stone. In 2017, I also published a new expanded and updated book that is a companion for this deck and for The Tarot of the Sevenfold Mystery. It is called The Tarot, Magic, Alchemy, Hermeticism, and Neoplatonism. It can be purchased on this site. Other Tarot decks by Robert M. Place that are not sold on this site include, The Angels Tarot, The Tarot of the Saints, The Buddha Tarot, and the Vampire Tarot. You may be able to find copies of these on the Internet. I am also the author of The Tarot: History, Symbolism, and Divination, which was given a stared review in Booklist and said to be maybe “the best book ever written on …the tarot.” Copies of this book can be found on the Internet and in many libraries. Hello is possible I buy with to you one deck which edition ? Yes, there are ordering instructions on each page for each item. For International orders I can send you a PayPal invoice. What did you want to order? 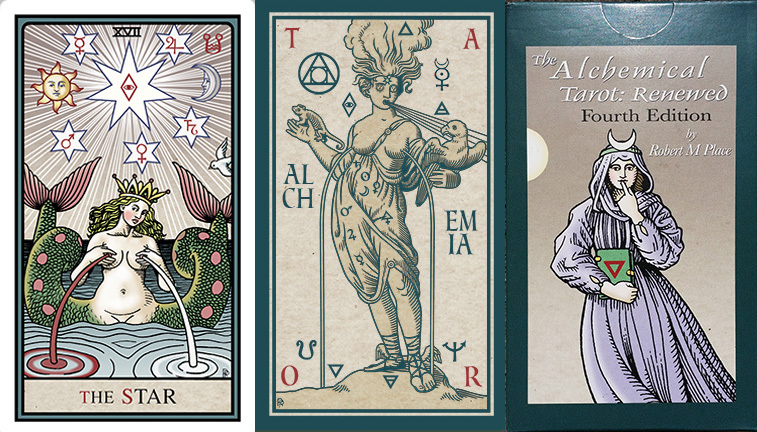 Hi Robert, can you send me a PayPal invoice and how much it would cost for the second edition Alchemical Tarot as I am interested in both Lovers? I am in UK, do you ship to Scotland? Thank you. I only have the 4th edition for sale. The deck s $30 USD and the shipping is $35 to the UK. To send you a PayPal invoice I will need your email address. Hello. I have the first edition of the deck but I do not have the book. Would you know if that is ever sold separately? Thanks. you should but the new book, Alchemy and the Tarot, it covers the same information and more. It is a better book. Thank you! I see that one. I just purchased a 4th edition deck from Rosemary at the Los Angeles Conscious Life Expo. Her husband gave me some of the backstory on the deck and I must say, I was very excited to get it home! The cards and artwork are absolutely exquisite. Each card and each symbol have their place and I really appreciate the amount of work that went into the deck. The two Lovers cards were a mystery, but mystery solved (one was deemed too explicit!). I do have a question for you, Robert: when doing a reading with this deck, would you recommend leaving in both Lovers cards, or taking one out? I use both. I find being able to differenciate between foreplay and action useful in readings. Hi again to Robert Place! I took your workshop and bought the first book and deck just after it was published, so I guess it was around 1995? In Berkeley, I believe, or nearby Petaluma, Sonoma County? I want to buy the most recent book of yours mentioned above and the deck. I can buy the book signed by you off of Amazon, no problems, I just wanted to let you know it is me, one of your earlier students. You should buy the decks and book directly from me. I will sign it for you and I can combine them in one package to save on shipping, It will be $63.00 I can send you a PayPal invoice for the correct amount if you give me your email address. Send me your email address and I will send you a PayPal invoice. Email it to me at alchemicaltarot@aol.con, I will also need to know if you live in the US or elsewhere. I am the principle author of the book as well as the designer of the Alchemical Tarot decks, Rosemary was my coauthor on the first edition of the book. I have #44 of your self published initial edition of the Alchemical Tarot. The backs are a turquoise and white design and the deck is quite thick and came in a unpainted wooden box. It’s a treasure. Do you not consider this edition the first edition? Before Thorsons? Oh, so what edition do I have? Was mine the 2nd edition? The one that came in a wooden box? With the light blue design with birds and stuff? Yours is the art edition that I made before I printed the second edition, but after the first edition was out of print. I’m going to buy this deck. I bought a deck recommended for learning but these make more sense to me. Will your book explain to me the cards in more detail? Or is it something else? 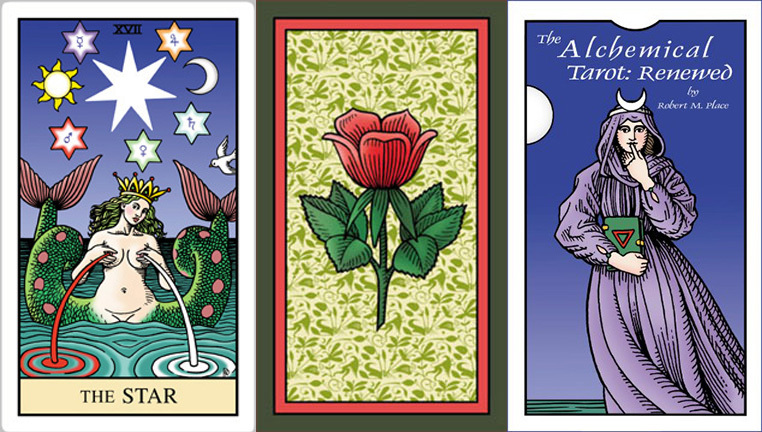 I would love to order the 4th edition of the alchemical tarot, how do I go about doing so? On the menu go to the Alchemical Tarot page and you will see how to order. Sorry, not for the first Edition. Yes the new book has everything that was in Alchemy and the Tarot and a lot more. The deck is $30 plus shipping, $7 for the US and $35 for international. To order send the payment with PayPal. You can use this link:paypal.me/RobertMPlaceTarot. Or I can send you a Pay Pal invoice if you give me your email address. I was wondering if it is still possible to order the rose back second edition of the alchemical deck. Sorry, no it is out of print. Hi! Is it possible to get the companion book for the Angel Deck? Sorry, I do not have any.